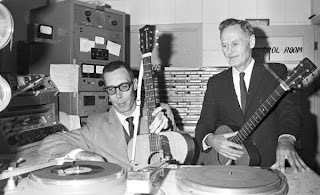 On the left, you can see Asa Martin (right) with Jim Gaskin at radio WIRV in the late 1960s. Roberto was so kind to send me a bunch of other Asa Martin songs I didn't post before and I want to share them with you. I first thought of an CRH compilation, but then I decided to post them this way here, because I think it's easier. Last week, I wrote an article about Dennis W. Taylor, a rich farmer from Richmond, KY. Taylor was instrumental in bringing many Kentucky old-time musicians to Gennett Records and so he did with Doc Roberts, Martin's long-time musical partner. Roberts' farm bordered on Taylor's and when Taylor was looking for artists to record, he choose Roberts. This led to a long-running contract with Gennett and although Roberts had several other guitarists to back him, he picked Martin for his annual 1928 Gennett recording session, which was the beginning of a successful and long career. I don't know what to say else: enjoy the music. Thanks to Roberto for sharing these gems! Asa Martin was one of my favorite old-time musicians. I especially like the alternate take on "She Ain't Built That Way"! Thanks very much for posting! I love Asa Martin and it's sad how unknown he is. I have been searching hard for crawlin and creepin (?) by him. Anyway, i'd love to hear these tracks but the link is defunct. Thanks! Unfortunately, I haven't these recordings anymore. Since megaupload was taken down, I lost many files. I haven't most of them anymore.